Arranging a funeral can be a difficult task that a family member may have to carry out during a very stressful time. Will they know what your wishes were, what coffin to choose, how much money to spend, if there sufficient money to cover the cost of the funeral. By planning your funeral in advance you can remove one layer of stress from your family at that very difficult time. If you are thinking about planning your own funeral, you will hear the terms Pre-paid and Pre-planning. What is the difference, which one is right for you. In both cases we will talk you through the arrangement process, advise you on what options are available to you at each stage. We will then list your requirements and give you a detailed costing for your funeral package. If you wish to pre-pay, then the Funeral Director costs will be frozen for a number of years, however, the external payments will not be frozen and the family may be left with a shortfall when the time comes to arrange the funeral. You should discuss your plan with your next of kin / executor; they should know where the plan is kept and who to call when the time arrives. You could talk to your chosen financial institution and advise them that you wish to set up an account for the purposes of paying the funeral costs. It is important that your next of kin / executor have immediate access to these funds at the time of death. Just as having a will gives you peace of mind, having your funeral arrangements organised is just another part of that process. What is the benefit of paying in advance for my funeral? Funeral Directors will freeze their costs at the time of payment, however external payments which would include: Grave purchasing or opening, Cremation, Flowers, Press notice etc, may increase and your family could be left with a shortfall. 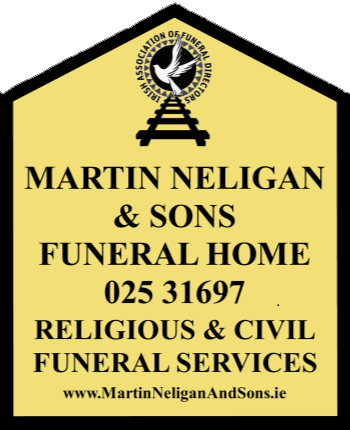 Do Martin Neligan & Sons Funeral Directors charge for their Pre-planning service? Can you make changes to your plan as time goes on? Absolutely, this is your plan, we are happy to make any changes you may require.